Five new three-point mounted tedders in the 5.2 – 7.8 metres (17 – 25ft) working width bracket are now available from Kuhn Farm Machinery. These 02 series machines offer a number of significant improvements over the earlier 01 series models, including fully sealed low maintenance rotor gear housings. The rotor wheels are wider and larger in diameter than those of their predecessors, improving the load carrying capacity. On the larger models (GF 7702 and GF 7802) the headstock has been designed with two large shock absorbers to soften the impact of lateral movement when turning at the headlands. The headstock is also fitted with a suspension system to improve stability of the machine in transport. Kuhn’s new 02 series three point mounted Gyrotedder range includes machines with smaller rotors (1.3m or 1.5metre) as well as alternative models with fewer numbers of larger rotors (1.8 metre), allowing operators to select the system best suited to their conditions. As with all Kuhn’s current Gyrotedder models, the 02 series machines have the patented Digidrive multiple finger couplings on the rotor drive shafts that improve quality of work and reduce maintenance costs. All models have a centralised oblique setting function for working at the edge of fields; this is mechanically operated on standard models and is available as a hydraulic system as an option. All of the three point mounted models fold hydraulically for transport to less than 3 metres. The starting prices for basic models in the range are: GF 5202 (£6676), GF 5902 (£8095) GF 6502 (£8992), GF 7702 (£11725) and GF 7802 (£10803). 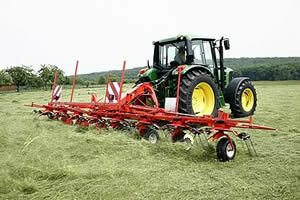 Kuhn already has two large trailed Gyrotedders in the 02 series in the 13m GF 13002 and the 17m GF 17002.